Well, this is just a quick post, squeezed in between chocolate eggs. This weeks crocheting has all been Easter gift related, quick fix crochet, lots of fun and lots of colours! These were Easter cream egg cosies in such Eastery shapes as bunnies, lambs, chicks and one-eyed aliens! The pattern is easy to follow, in a simple slip stitch which makes the stretchy cosy easily able to fit a hens egg to keep your boiled egg warm. The pattern is a ravelry pattern which I did in stylecraft (using some of my more girly colours)....I highly recommend it for a last minute gift idea. These butterfly wings were quickly finished off with a ribbon to tie around the chest. I spent ages deliberating the elastic arm loops on other wings I've seen, and decided on this simpler method for my small niece. These were my own 'see where it goes' design. 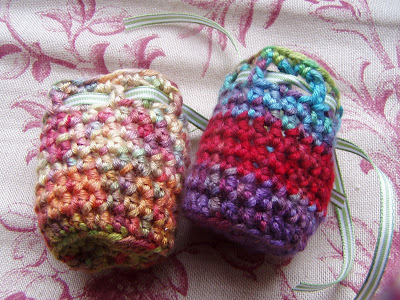 I made these lovely little drawstring bags for my mother and mother-in-law with a couple of small eggs in. The pattern was a ravelry pattern and I used Rico Micro DK which just has the most beautiful colour changes and lovely sheen. We have had a lovely Easter Sunday with our traditional egg hunt at my in-laws house with a huge scrumptious lunch which we all chipped in on. I would show you the pictures of my heart-attack sausage rolls, but they've all been scoffed, along with the cheese muffins and quiche....my sister-in-laws famous lasagne, chocolate mousse, carrot cake all washed down with some chocolate eggs! My family really know how to eat! Looking forward to looking at all the other projects on this week....that is after I've eaten a little more chocolate. 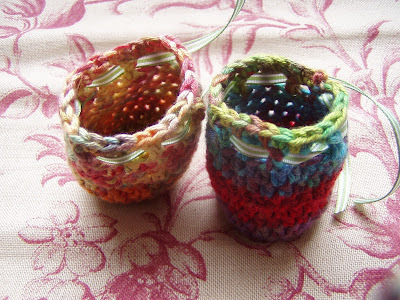 Nice Easter crocheting, your little egg warmers are cute. I am always amazed at how much you manage to get done! Happy Easter! Such pretty projects that you have made up. 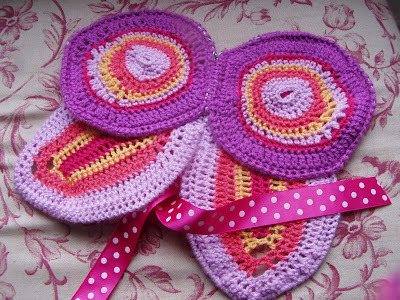 Love the crochet especially the butterfly wings!! The drawstring bags are delightful! Easter one-eyed aliens LOL. Sounds just perfect to me! What a lovely butterfly wings, what a great idea they look amazing. I love the little egg cozies too!! I love those little drawstring bags- what a fab idea. And that yarn looks delish, too. Great little easter gifts, and I love the wings! The little bags are beautiful, and the feast sounds scrumptious. Lots of lovely fatty flavourful foods! 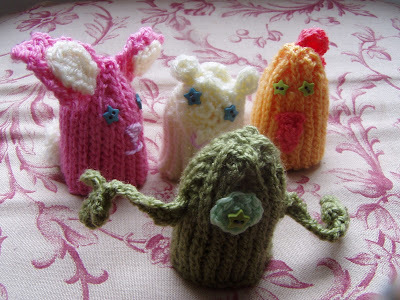 What lovely easter crochet, my favorite has to be the one eyed alien!! Hope you had a lovely Easter and that sure sounded like a delicious feast. 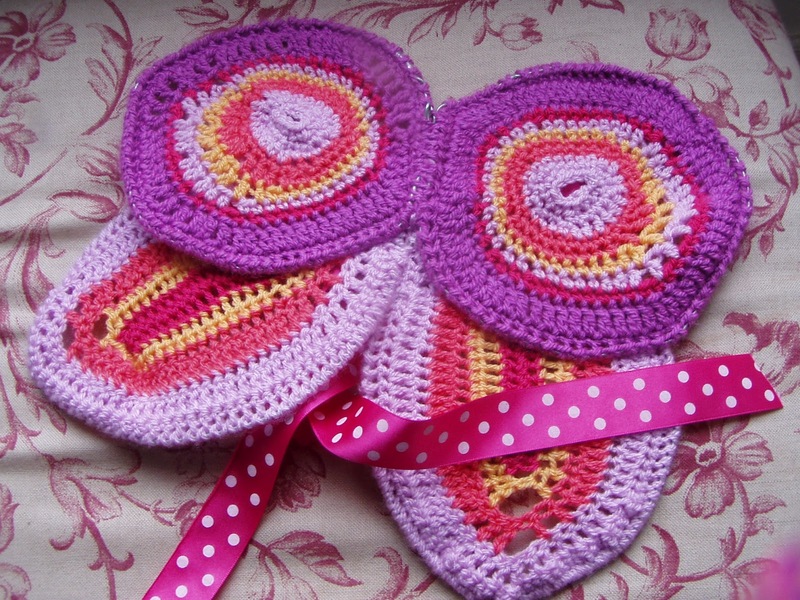 I love the little egg cosies and those butterfly wings are just to cute for words. I like the idea of the ribbon as its then easier to open when they want to take them off. Love the little drawsting baskets. Gosh you've been busy with that hook! Sounds like you had a great weekend !